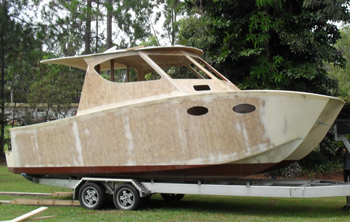 The owners of this Spirited 230 project have been building in a very small shed so have been keen to see their boat outside to get a good view of it. The unconventional way the boat was moved out of the shed was very interesting - we never seem to have a good excavator around when we need one! The workmanship appears to be first class with very little bog used which is always a good sign. 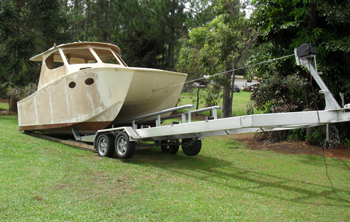 The clients will be using this boat as a personal ferry across Moreton Bay to Moreton Island so have customised the interior to provide an open plan layout suited passengers and various loads. Another addition were the two hull portlights into the forward cabin for extra light and ventilation. We will keep you informed as this project progresses. For information on this design, please view our designs page.